This is an anti-Arian tract by Fulgentius of Ruspe, Ep. 8 of his correspondance. Then we have Comm. in Mythologiae, found in B.IV.38, starting folio 92, the Commentarius in Fulgentii Mythologias. This is a commentary on the Mythologiae of Fabius Planciades Fulgentius, a fellow African who live around the same time as the Bishop of Ruspe but is a different person altogether. Some have previously thought them the same, but, as I understand it, scholarly consensus today divides our two Fulgentii. What is strange about this index is that, after the commentary on the other Fulgentius, we are directed to the De Fide ad Petrum in DCL B.II.27 by Fulgentius Ruspensis, as though this were a work by a different person. I assume the index was compiled by someone different from the catalogue itself, since it gives the impression that we have two Fulgentii, but divides the works wrong. Why does this matter? Well, I have an interest in Fulgentius of Ruspe as someone who was influenced by the theology of Leo the Great and engaged in what some call ‘the Arian controversy 2.0’ — he shows the sixth-century synthesis of earlier theology. I am, perhaps, less interested Fulgentius the mythographer, but he is still worthy of interest for me as an intellectual historian whose work, when not analysing mediaeval canon law, looks at the fifth century. For both Fulgentii, mansucripts are important. In fact, manuscripts are important for all pre-print authors. Studying them helps us understand the authors better. Textual criticism brings us closer to their own words as well as showing us how they were read and interpreted in history. Furthermore, in a library like Durham’s, it is worth knowing which authors were transcribed and read. One of my hypotheses I want to test is the idea of canon law as theology, and the only way to do that is to consider the non-canon law books from the same library. If we can’t keep our Fulgentii straight, we’ll have trouble understanding the history of ideas and manuscripts. Anyway, all of this to say: I do look forward to Richard Gameson’s catalogue when it is finished. And I look forward to the day when all of these opera Fulgentii are digitised and can be worked on from the comfort of my own office. The Terrible Tudors is a fabulous book in the Horrible Histories series, but I like Durham Cathedral’s version better- the Tudors were terrifically interesting. There’s a new exhibition just opening at the cathedral to show off some of the amazing objects in their collections while also explaining why the Tudor dynasty were so very important for the history of the region. Go see the exhibition- it has some of my very favourite things in it! Details are here. One of the questions I’ve been asking myself recently is what effect would the immense changes of the sixteenth century have on people living in County Durham. I’ve been trying to think through the scraps of information we have to see what the vast changes did to people’s lives. There’s been lots written about charity and changing attitudes to the poor during this period, which would massively have affected people’s social safety nets. When Henry VIII got rid of monasteries, he was also getting rid of the almonries operated by monks, which provided care for people who needed it, often the sick and the elderly. At Durham Cathedral the almonry fell into disrepair quite quickly and removed one possible source of help in the city. Did other unofficial groups grow up to fulfil the need that the almonry had addressed? Did the new canons try to help? I don’t know the answer, but it’s a question I’d like to think more about. In addition to practical needs, I’ve also been thinking about the purpose of a cathedral. What did the orders from London about the Reformation do to people’s experiences of worship, both in the parish churches and at the cathedral? In 1536 the cathedral bought new service books with a slightly different order of service- could worshippers probably standing in the nave hear the difference in the Latin texts? Possibly not. From 1534 onwards, the bishop preached throughout the diocese against the Papacy. People would have heard about the new religious settlement, but it was not yet part of the common experience of worship. The Bible in English followed in 1536, as did the first of the dissolutions of the monasteries. St Cuthbert’s shrine was pulled down in 1538, what did that mean for visitors? After 1541, the cathedral would have felt very different with half of the monks gone, and the rest no longer wearing monastic habits in their new roles as cathedral canons. But the services would still have sounded much the same. It was at some point after 1549 that Cranmer’s new Book of Common Prayer was introduced in Durham. That would have marked a completely different experience of worship- it was all in English, and it rearranged the material of the older services. It would have felt, I think, like a complete break from the past at that point. Mary’s reign from 1553 to 1558 saw a return to the old Latin mass books. Durham Cathedral didn’t bother to dig out their old copies, but instead bought completely new sets, maybe because the old ones had been burned or given away. Elizabeth’s regime went back to the Book of Common Prayer in 1559. As much as anything else, the 1549, 1553 and 1559 changes in the service books would have marked out to listeners in churches the changes in religion that were mandated by Henry VIII’s very different children. If you do go see the exhibition in Durham Cathedral, stop by John Brimley’s tomb in the Galilee Chapel. He was master of the choristers from the 1540s until his death in 1576, and would have taught them very different music during each of the four reigns that he saw. We have payments for music to be bought for him and his singers from Westminster in Henry VIII’s reign. I would love to be able to ask him what he thought about the Tudors kings and queens and their impact on the city that he lived in. Just what is a Priory library book then? The most common question arising about the Durham Priory Library digitisation project is “So how many books are you digitising?” and my response always starts with “roughly …”. There are several reasons for this. One of the largest books, the Bible of Hugh of Puiset, shelfmark DCL MS A.II.1 is, in spite of that shelfmark, not one but four of the largest volumes in the project. Two of the incunables, in spite of having shelfmarks Inc.26 and Inc.40 are bound in a single volume (this bizarre decision always leads to a moment of panic when fetching the one that is not shelved where it would be expected to be). To further complicate matters, people will keep identifying new Durham Priory books. Statistics aside, this raises a far more interesting question for the project – what is a Priory library book? On one level the answer to this has been simple: all books, manuscript and printed, are listed in Andrew Watson’s Supplement (1987) to Neil Ker’s Medieval libraries of Great Britain A list of surviving books (second edition 1964). The proportion of the Supplement taken up by Durham is impressive: 19 of the 74 pages listing books and 16 of the 39 pages naming donors. Those few of you who do not have your own copy immediately to hand can view the data online at http://mlgb3.bodleian.ox.ac.uk/ or restrict it to Durham Priory books alone. There are a few problems with this list, though. Firstly, it has quite rigorous criteria for identification, some of which are not always appropriate and others which just do not cover the required scope. One means of identifying where a book was produced is the liturgical content, local saints and religious commemorated in calendars can indicate the location where it was written. This holds more weight early in the medieval period though, when fewer books were being produced by fewer scribes. Does the presence of local saints, priors and bishops of Durham in a 15th century manuscript make it a Durham Priory or just a Durham region book? BL Harley MS 1804 has these, but for it to be a Durham Priory book we also have to accept that a monk would own a book of hours, which seems less likely. My main problem with the list as it stands though is that it is too narrow. The most obvious example of this is that it omits DCL MS B.IV.46, a collection of 14/15th century catalogues of Durham Priory Library books which is packed with internal evidence of Durham Priory provenance. There is a significant body of material omitted from MLGB3, particularly because it is classed as archival, so the project has included digitisation of most of the volumes produced by the monks, cartularies, registers and catalogues, as they represent a significant part of their scribal activity. 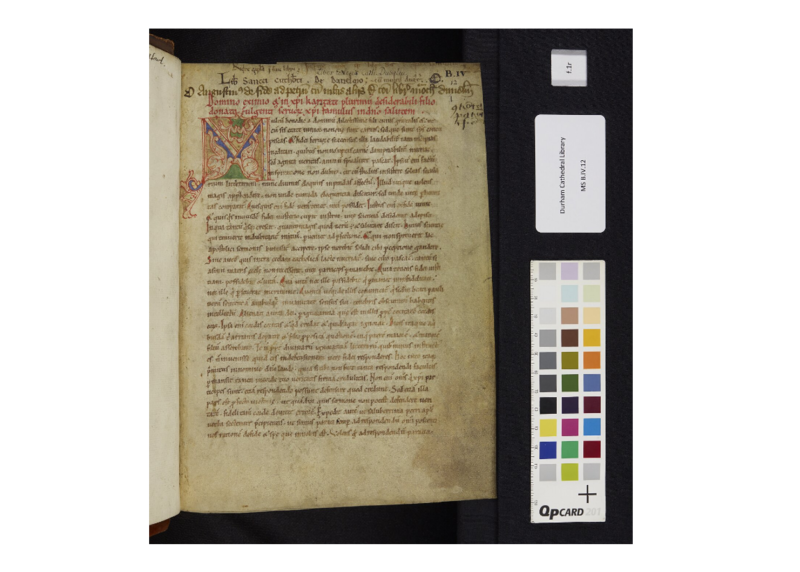 A particular case in point is DCL MS C.IV.24 (in MLGB3) and the Priory Registers and DCD Locelli III.40 (which are not). 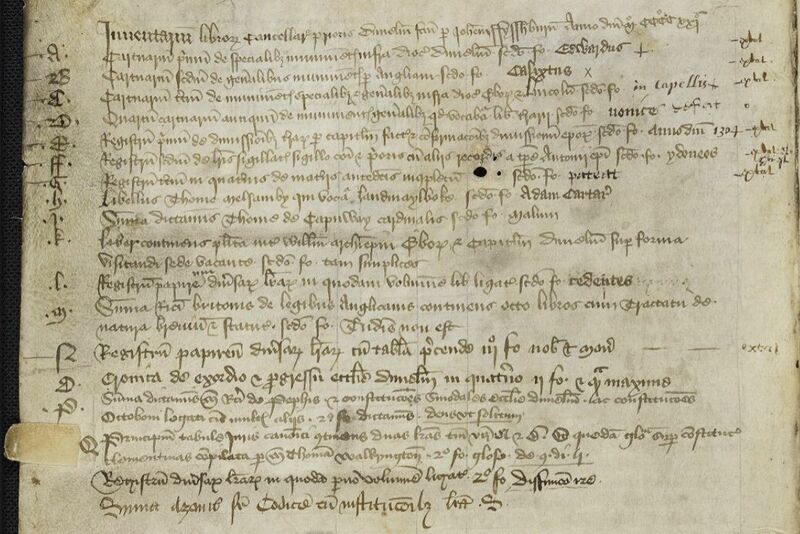 DCL MS C.IV.24 includes a formulary of letters, the Priory Registers contain letters and Locelli III.40 is also a formulary of letters. MS C.IV.24, being stored with the rest of the book manuscripts in the Library, counts as a library book. We know from an entry in Priory Register II that in the early 15th century there was a shelf of books in the Chancery of the Prior of Durham which included C.IV.24 and the registers together. It is not a book but a roll, a format extremely familiar to the monks of Durham but now less associated with libraries and more with archives (which is where this item now lives). It too has been digitised, and is a fortunate survival showing that the working library of a Durham monk was not just books on shelves.